David was born and raised in Milwaukee, Wisconsin. He graduated in 1997 from the University of Wisconsin-Madison where he played on the golf team and was named Most Valuable Player. David has played competitive golf for many years. In 2004, he won the Wisconsin State Open and finished tied for 31st at the U.S. Open Championship at Shinnecock Hills. He also played on the PGA Nationwide Tour in 2006 and 2008. In 2016, David was inducted into the Wisconsin Golf Hall of Fame. 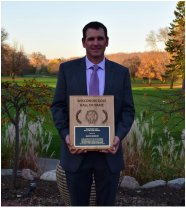 He earned 2014 PGA Player of the Year honors and was named 2013, 2017 and 2018 Wisconsin PGA Teacher of the Year. He won the 2013, 2014, 2015, 2018 Wisconsin PGA Match Play Championships, the WAPGA Player of the Year in 2011 & 2007 and the WAPGA Championship in 2007 and 2010. He finished 17th at the 2010 PGA National Assistants Championship in November 2010. David is also the former Varsity Golf Coach at Divine Savior Holy Angels High School in Milwaukee. In his first year of coaching, David led the team to a 4th place finish at the 2010 WIAA State Tournament and was named "Coach of the Year" by the Milwaukee Journal-Sentinel. The team finished 3rd at the 2011 WIAA State Tournament. David has contributed to Milwaukee Journal-Sentinel's Golf Beat, a golf blog written by Gary D'Amato. His blog contributions, titled "David Roesch's Lesson Tee," were posted each Friday throughout the 2010 golf season on jsonline.com. To read Golf Beat and David's past blog entries, please visit www.jsonline.com/blogs/sports/golfbeat.html.